As stated I believe that near past asteroid fall had impacted into an ocean and I believe a likely candidate for the impact site was the Indian Ocean. As is well known we have various legends of a Great Flood having taken place in the past especially in Mesopotamia. If I have identified the Tree of Life as a representation of an impact mushroom cloud. That bulls associated with the Tree of Life are animal imagery butting metaphors for the earthshock of the impact event and that snake, serpents represent the weaving smoke trail of the incoming asteroid. To find we also have a legend of a great flood from exactly the same Mesopotamian ancients who used such impact metaphors as bulls, snakes and Trees of Life in their religious iconography obviously then falls into place and context . A large asteroid impact into an ocean would create an immense uplift of water into the atmosphere which would fall like an overwhelming torrent, flood of water from the sky onto surrounding human cultures. Such a large impact would create super cyclonic weather conditions, heavy rain storms and flooding rivers adding to the impact caused deluge. A tidal wave caused by an ocean impact would also add to the watery inundation of surrounding lands. It is generally accepted that the Great Flood of Noah mentioned in the Bible is really just an adaption of the earlier Sumerian Flood tale and in some places reads almost the same flood account word for word. The Sumerian Godly pantheon had three main creator deities. One god An was lord of the heavens. One god Enlil was lord of the wind, the storm. And another god Enki was lord of the water known in Akkadian and Babylonian myth as Ea or Oannes. The main temple of Enki was at Eridu the most southernmost Sumerian city on the banks and marshy delta of the Euphrates River where it originally entered the Persian Gulf. The area has now silted up and Eridu now lies many miles from the ocean shoreline. The Persian Gulf in turn connects to the Indian Ocean, which I postulate was the ocean impact location of that past asteroid fall. Eridu was considered the first city of the Sumerian Kings and the earliest city in Southern Mesopotamia and is argued to be perhaps the oldest city in the world. Interestingly it was only 12 kilometres from the Sumerian city Ur which we are told is where Abraham of Bible fame came from. We are told in myth that Enki lived in ‘the house of subterranean, cosmic waters’, known as the Abzu. At this point let us picture in our minds the asteroid impact event. The asteroid impacts into the ocean causing a huge uplift of water into the air. At the same moment a huge dome-like Wilson cloud appears, formed by the terrific explosive detonation. The fireball then rises up into the air within its mushroom cloud, a mushroom cloud, as explained, when schematised to its barest elements looked like a deity with upraised arms. Such an epochal, breath taking sight to an ancient observer would have left him gasping for description. He seemingly witnessed a god-like form rise up into the sky. It rose up from the ocean. It rose up from a dome like structure which itself had seemingly appeared,’ erupted up from the ocean’. The notion then formed in his mind that the dome like structure he sighted (the Wilson cloud form) was a ‘type of watery house’ that had seemingly risen up from below the ocean and from that ‘watery house’, a god-like figure form had then emerged(the mushroom cloud schematised figure form) which then rose up into the sky. This then is the sequence of eruption events I believe that caused the Sumerians to surmise that ‘Enki lived in a watery house’. Below on the left is a Sumerian depiction of fish clad priests of Enki standing facing a type of stylised ‘Tree of Life’ image. The base of this ‘tree is distinctly dome-shaped’. I believe it represents the dome-shaped Wilson cloud form that appeared on the ocean from the initial explosion, detonation of the impacting asteroid. And the reason why the priests here are fish clad to indicate its watery association. Because the eruption cloud then rose up into the air the ancients had the notion that it ‘flew up like a bird’ and so artists improvised and stylised the erupting mushroom cloud to look like a ‘winged bird’ carrying Enki up into the sky. Adapa was the son of Enki, and was called ‘the first man’ and equated with Biblical Adam. He was portrayed as a half fish, half man who was a priest, sage of Enki. The Sumerian word Abgallu meaning sage could be broken down into composite parts. As outlined the huge eruption mushroom cloud that rose up from the ocean impact site when schematised to its bare graphic elements resembled an immense upraised armed man-like deity who obviously was thought of by the ancients as a ‘man/deity of great size’ associated with a ‘watery origin’. Essentially Adapa was just another persona, like his father Enki projected onto the same eruption sight. As I have mentioned the act of Baptism is literally a religious re-enactment of this very scenario. That the baptised believer rises up from water with upraised arms, action mimicking with his body the sight of the erupting mushroom cloud. Ceremonial washing areas in the Abzu temple of Enki and Adapa at Eridu were later adopted as tanks of holy water in Babylonian and Assyrian courtyards which were also called Abzu and most probably the basis behind Islamic washing pools in Mosques and the baptismal font in Christian churches. As stated the Sumerian entity Adapa is compared as a prototype of Biblical Adam. In legend Adapa is gifted great intelligence but when offered the gift of food from the Sumerian creator god Anu declines it and in doing so loses the gift of immortality, a theme of food and loss of immortality that is closely echoed in the Genesis tale of the apple, Adam and Eve. Considering that Abraham lived very close to Eridu in Ur and must have been very conversant with such Sumerian legends one must suspect that this tale, like the Sumerian Great Flood account, has been adapted and refashioned later into Hebrew myth. 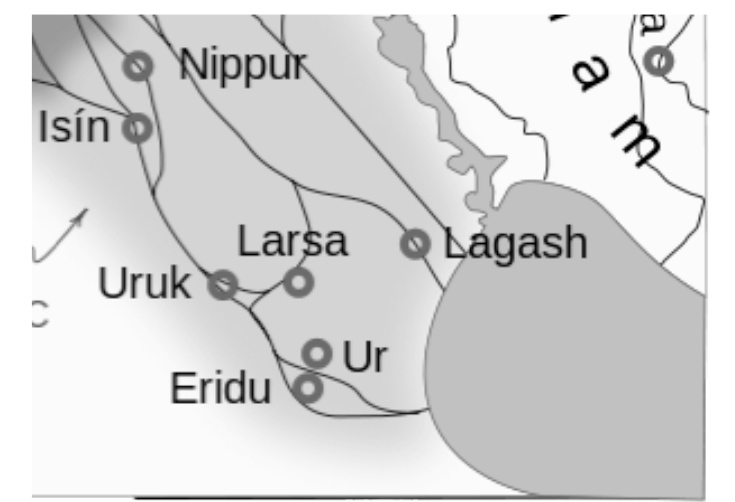 In legend Adapa was thought to have come to Southern Mesopotamia from the land of Dilmun, thought to be Bahrain, further south in the Persian gulf and in the direction of the Indian Ocean where I believe the impact took place and so logically from the direction where the first impact inspired mythologies would have coalesced into being. The depiction below shows Enki leaping into the air with upraised arms below a winged disc. As outlined his upraised armed form equates to the schematised form of the impact mushroom cloud sight. As mentioned the ancients imagined the rising mushroom cloud (the form of Enki) to have ‘flown up into the sky’ and the artist has purposely drawn his lower legs in a leaping motion to further visually indicate he has ‘left the ground and has risen up into the air’. Winged entities are further placed either side with Enki to also visually reinforce the idea of the ‘flight of the mushroom cloud’ Enki’s body form represents. The disc image above the head of Enki is I believe an image of the rising fireball which was also imagined by the ancients to have ‘flown into the sky’ and so given wings to visually indicate its upward flight to the viewer. This winged disc representation of the sight of the uprising fireball is found in many cultures in the Middle East and Egypt. Flanking Enki are two upturned pots of water which pour down into two pots below which are artistic stylizations to visually indicate the fallout of water from the sky his impact mushroom cloud shape was responsible for. The two winged deities above and the Assyrian winged deities below hold pails indicating the upraised armed form of Enki and the stylised Tree of Life below (really a tree shape interpretation of the mushroom cloud) was responsible for pouring water down onto the populace from the ocean impact upheaval causing the Great Flood event. As mentioned we have the male sea god Enki who was lord of the Abzu or subterranean watery abyss, the abyss alluding I believe to the impact site and crater itself. But feminine genders were also interpreted from the same impact, eruption event. We pick up the threads in later Akkadian legend which tells us in (Sumerian) creation myth the primordial goddess Tiamat mated with Enki or his watery Abzu and she is described as a goddess of chaos, as ‘the shining personification of salt water who roared and smote in the chaos of original creation’. Such ‘shining’ description equates I believe with the sight of the blazing fireball, explosion. Her ‘roaring and smoting’ equating to the tremendous sound of the explosion and the shattering effect of the concussion, blast wave. The’ salt water chaos’ associated with her describes the upheaval of water from the subterreanan Abzu or abyss, The abyss referring I believe to the crater caused by the sea impact of the asteroid. Pertinently we are also told she created dragon/ serpent monsters. The dragon/serpent here alluding to and representing the weaving snake-like smoke trail of the incoming asteroid which had impacted into the watery Abzu-abyss(crater). The primeval chaos, upheaval of water from the ocean impact and a serpent are themes that are repeated in other mythologies. In the North-Western Semite mythology of the Canaanites we are told the god Baal battled his sea-god brother Yam and his pet serpent Lotan, also called leviathan in the Bible. To someone viewing the colossal uplift of seawater from a large impacting asteroid but has no idea or knowledge it was caused by an impacting asteroid it will naturally seem as if the ocean has suddenly erupted in a raging turmoil of unrestrained violence. The bewildered Semite ancients then invented the sea god Yam to explain and attribute that chaotic ocean upheaval caused by the impact. What they also saw in the same spectacle was the weaving, snake-like smoke trail of the incoming asteroid reaching down from the sky to the impact site whereupon the ocean had suddenly erupted in huge commotion. So they, like the serpent associated with Tiamat in Sumerian creation myth, imagined the asteroid smoke trail to be a serpent, named Lotan (leviathan) and because it had reached down to the ocean which then violently erupted they conjoined the serpent in myth with the sea god Yam who was thought to have caused the ocean upheaval and framed the serpent Lotan (Leviathan) in the context as the ‘plaything, pet’ of Yam. As I have shown the form of the god Baal-Hadad is actually based on a rock art schematisation of the eruption sequence spectacle. So when the resulting Wilson cloud appeared and mushroom cloud erupted up from the watery commotion chaos of ‘sea god Yam’, the ancients then projected the persona Baal onto that mushroom cloud sight. So the ancient Semites had effectively differentiated and created three separate deities from the one, same impact event. 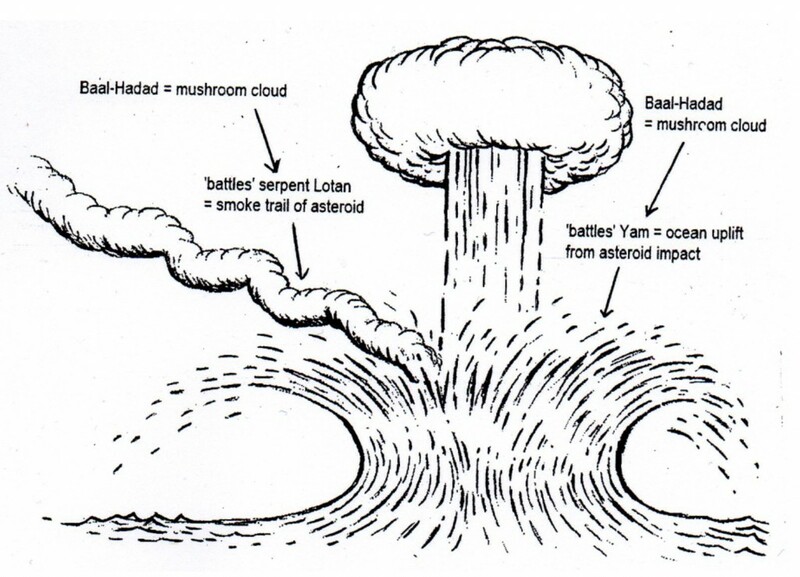 The incoming smoke trail became Lotan(leviathan),the impact upheaval of ocean became Yam, and the resulting mushroom cloud became Baal. Because the impact explosion was understandably an enormous violent conflagration they invented the notion that a ‘giant fight, battle’ had taken place between the three differentiated deities. That Baal (the mushroom cloud sight) fought his sea god brother Yam (the ocean upheaval sight) and his serpent Lotan (the incoming smoke trail sight). The Sumerians and the Semites were not alone in differentiating separate deities to represent the varying physical aspects of the impact eruption event. And in instances then projecting the notion of a giant fight, conflict, or commotion had taken place between those related deities. It is from these differentiated circumstances that whole pantheons of gods and goddesses were created from the one same impact event in ancient times. 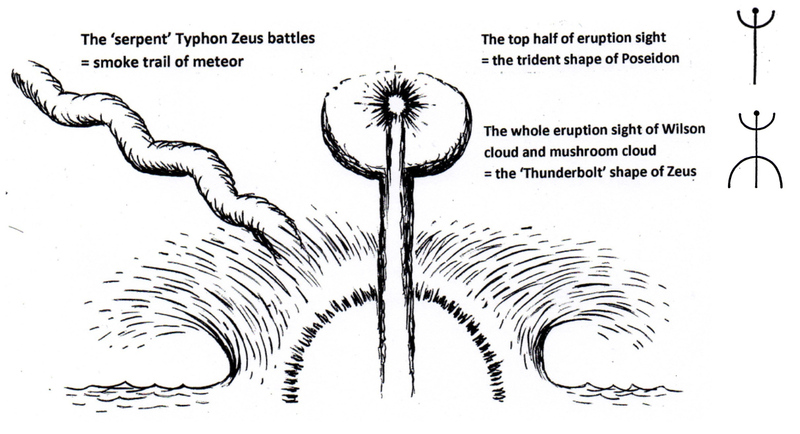 As stated the chief Greek god Zeus carried a thunderbolt, the imagery of which represented the conjoined schematised eruption sight of the Wilson cloud and mushroom cloud. The brother of Zeus was Sea God Poseidon whose trident symbol as explained was taken from the top half of the schematised eruption spectacle which told in myth ‘stirred the waters to fury’, description which would clearly describe water upheaval from an asteroid ocean impact. Poseidon was also a god of earthquakes which makes contextual sense if his ‘trident’ shape represents a meteor impact mushroom cloud. We are also told that brother of Poseidon Zeus battled the serpent Typhon. So we find in Greek myth the same corresponding impact imagery elements of ocean upheaval and serpent description as we find in Sumerian and Semite myth. Turning to Egyptian mythology we find the serpent deity Apep who was also associated with ‘the waters of primeval chaos, equated with storms and earthquakes’ and was the arch enemy of the creator sun god Atum-Ra. Again such description aligns with similar serpent, chaotic water upheaval description found in the Sumerian, Semite and Greek legends already outlined. Apep represents the snake-like smoke trail of the incoming asteroid. The ‘waters of primeval chaos’ represent the upheaval of ocean when the asteroid impacted. That Apep was aligned with storms relates to the extreme weather commotion caused by the huge impact. That Apep was equated with earthquakes aligns with the huge earthshock produced by such a large asteroid impact. We are told that the serpent Apep ‘fought with the Sun god’ Atum-Ra. Obviously the idea of a serpent ‘wiggling’ his way across the vast distance of space to battle our solar sun does not make much contextual sense. But if we interpret the ‘sun’ mentioned in this myth as instead referring to the blazing, sun-like fireball, that indeed would have outshone the sun as it rose up from the impact conflagration, then it throws this myth into contextual sense. The snake-like smoke trail of the incoming asteroid reached down to where the asteroid struck the ocean and exploded. The subsequent blazing fireball, rising up into the air, would have brought it into close proximity with the serpent like smoke trail still hanging in the sky above and the awestruck ancients assumed from this epochal spectacle that the ‘sun (really fireball) was ‘rising up to battle the serpent’ (really smoke trail). This circumstance applies for other myths concerning ‘serpents battling the sun’. As reiterated the impact event was scientifically uncomprehended by the ancients. Without any basis of scientific parameters or constraint some ancient cultures completely over-embellished the description of the impact event with fantastical hyberbole and deity persona inventions so that over time compiled mythology that eventually bore no recognisable context to an asteroid impact event at all. We can only pick out and read between the lines of such convoluted mythologies recognisable known aspects of an ocean asteroid impact event and to piece such jigsaw impact clues together. One such myth is the ‘Churning of the Ocean’ in Hindu mythology. Two warring parties, the Asuras and the Devas, under the auspices of elephant riding Indra, the god of Thunder, Rain and War, and who is also identified with a bull, ‘churn the ocean using a huge serpent for control of the universe’. The Asuras demons we are told are poisoned by the vapors coming from the serpent’. So if we examine this colourful description we have description in this myth to chaotic, churning water upheaval, a reference I believe to the asteroid impact induced upheaval of ocean. 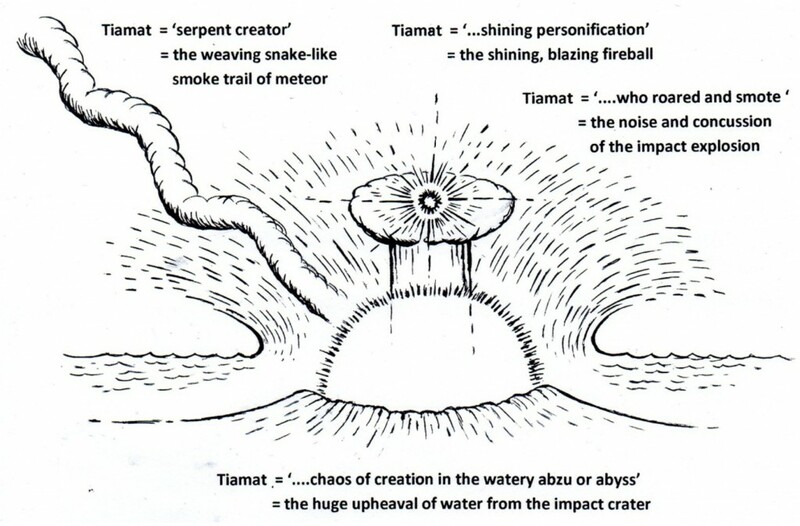 A description of a serpent, a reference to the incoming snake-like smoke trail of the asteroid. A description of poisionous fumes, a reference to the overpowering explosive fumes that would have surely been produced by such a gigantic impact explosion. The god Indra was aligned with a bull and as outlined bull gods abound in especially Middle Eastern Mythology, the bull being a butting animal metaphor for the enormous groundshock produced by the asteroid impact. In India and other Eastern countries the powerful elephant was also chosen as an animal ‘butting’ metaphor to represent the mighty groundshock of the impact event. That Indra was a god of Thunder and Rain is a reference to the cyclonic weather and downpour of rain resulting from the impact, equating to the weather commotion and Great Flood Legend in Sumerian myth.